One of the most popular appetizers at our daughter’s wedding was savory sweet potato wedges on a stick. Everybody was raving about them. This is one of those rare recipes that just about everyone loves and can eat (gluten free, vegan, etc.). It’s also super healthy and inexpensive. What’s not to love?! These take about 10 minutes prep time and 20 minutes oven time. 1. Cut the sweet potatoes into wedges about 1 inch wide, 5 inches long, and 1/2 to 3/4 of an inch thick). Use a wide bladed “chef’s knife” to make this easier. I have a Santuko knife that works well for this. They will look something like thick sweet potato fries, but they should be wider than the usual fry size. 3. In a large zipper top bag, combine the sweet potatoes and oil. 4. Add the spices to the bag and toss everything to coat the potatoes. 5. Line a cookie sheet with foil and spray with cooking spray or use the foil that is non-stick. 6. Place the sweet potatoes on the pan and bake uncovered, turning the potatoes over after 10 minutes. 7. When the potatoes are tender, remove from oven. 8. Insert sucker sticks into the sweet potatoes and serve. So good! 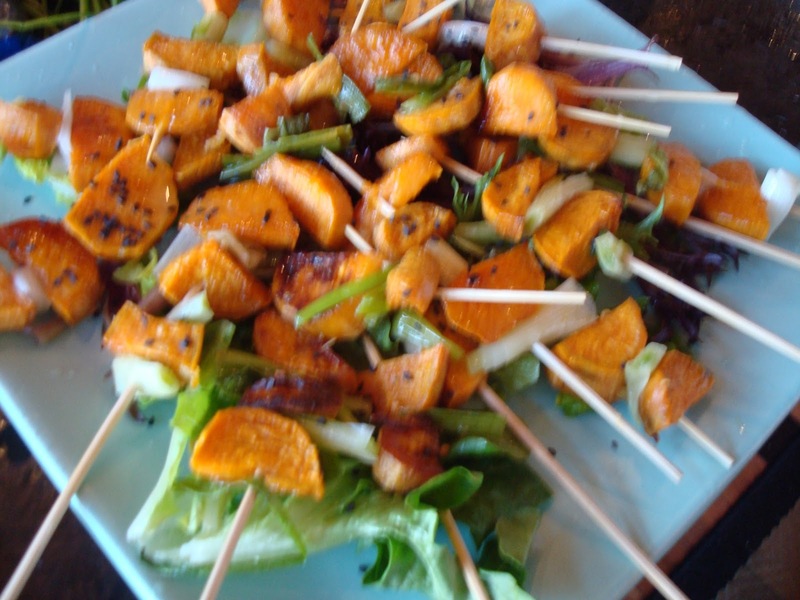 You could also make these kebab style (see photo above) with squares of sweet potatoes threaded onto sucker sticks or short skewers. Instead of turning the potatoes after 10 minutes, just stir them as best you can. You may have to cook them a little longer as needed. As a side dish, skip the the sucker sticks and just make these as bigger chunks. You will have to adjust the cooking time, which might be about 45 minutes depending on the thickness of the chunks. I hope you give these a try. They are really wonderful.